Stommel Haus is a German Premium Supplier of bespoke, sustainable and healthy, off-site manufactured timber houses – Delivering high quality, energy efficient and eco friendly luxury new build homes to the UK. ... then you have come to the right place. A new Stommel house is coming to the UK: As from March 2019 another sustainable, healthy bespoke eco home is being built in Dorset. The house is located in a beautiful location on the Isle of Purbeck. The owners have already given it a name: "Heartwood", reminiscing their love for the house as well as the fact that the house is built with Nordic spruce heartwood. Click here for more. Stommel Haus further improves energy efficiency and introduces Jute insulation. Read more. There is no better argument for a product than positive feedback from clients. 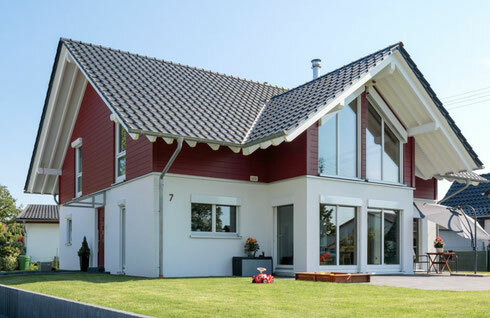 Stommel Haus thrives on delivering the best products possible and providing true dream houses to their clients. The positive comments of our clients motivates us to continue to offer excellent craftmanship and the highest quality. We obtained three fantastic 5-star reviews on Houzz recently, one from Surrey , one from Norfolk and one from Warwickshire which we are very proud of. The Houzz community loves Stommel Haus - We received two Best of Houzz Awards 2018. Contemporary house with render-timber combination exterior - Stommel Haus "Juniper"
House "Grey Alder" - a beautiful 3 bedroom family home. The house uses Stommel Haus' latest "Softline" exterior which is very durable 50 mm thick arctic spruce. "Grey Alder" won the "Climate Protection" Award by Innogy and the Council of Neunkirchen-Seelscheid.